You know, this may be the first bipartisan thing Trump has done that both sides can get behind. 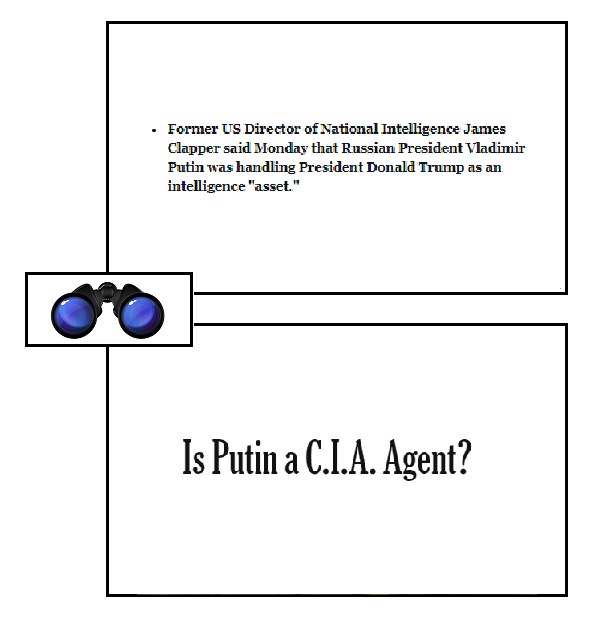 Nonpartisan, right now, means disturbed by the firing, by its timing, by its implication for ongoing investigation into Team Trump’s ties with Russia.. The optics of firing the FBI director investigating your Russia ties then meeting the Russian FM on THE VERY NEXT DAY defy easy description. When you fire the guy who is investigating you on Tuesday and meet with your case officer on Wednesday..
From my analytic point of view, alert for pattern and archetype, what leaps out here is another damned ouroboros — this whole place is getting to be quite a snake-pit. 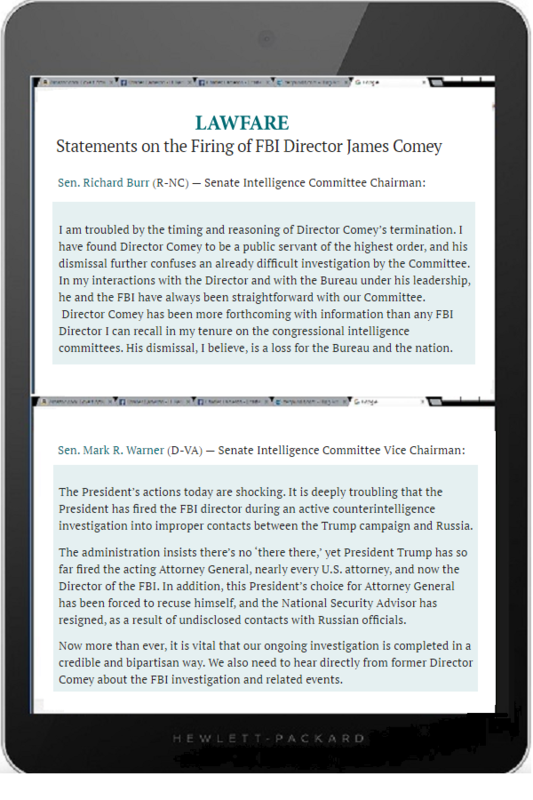 The extraordinary dismissal of the FBI director by a president whose own campaign is the focus of an ongoing FBI investigation is sure to produce a torrent of criticism that Trump is interfering with the independence of law enforcement. Attorney General Sessions, who had recused himself from the Russian investigation, played a role in firing the man leading it. Maybe we could call that “recusal of the recusal”? 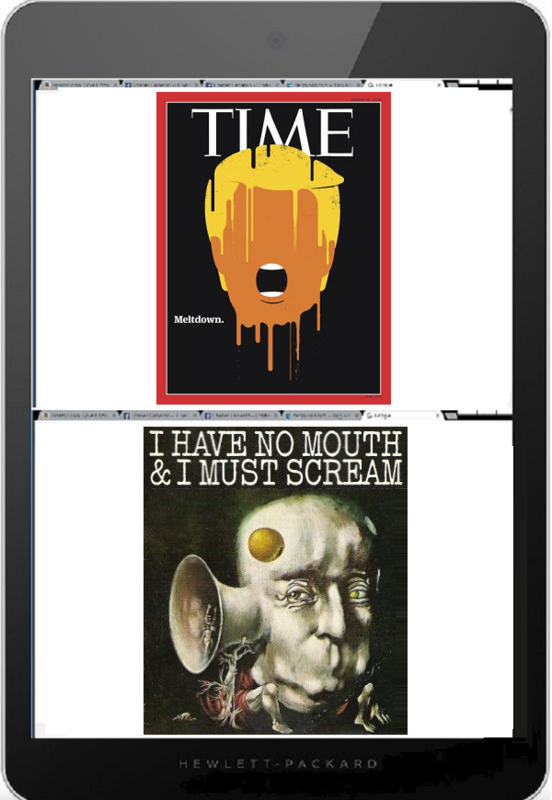 From a purely graphic angle, the two images mirror one another quite nicely, and arguably the meltdown is the cause for the need to scream. I generally try to avoid politics, but when it leaks over into the same religious issues I’ve been studying and writing about here for a few years now, I’m liable to voice my opinions. 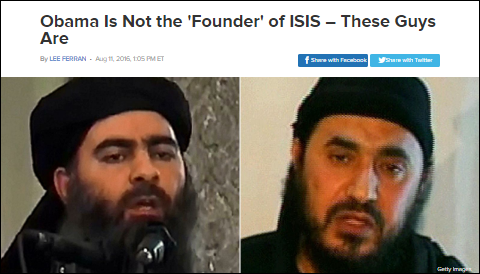 I meant he’s the founder of ISIS. I do. He was the most valuable player. I give him the most valuable player award. I give her, too, by the way, Hillary Clinton. It’s not every day the presidential nominee of the Republican Party calls our commander-in-chief a “founder”—that is a terrorist, a traitor, and “MVP”—of the global Salafist caliphate, an organization that commits mass murder and even genocide. Not to mention that ISIS seeks to kill Americans with gusto at home and abroad. Trump’s claim is so absurd as to render terror experts speechless. In the first place, ISIS was born in a practical sense in 2006, when elements of Al-Qa’ida in Iraq fused with bitter-enders from the Saddam Hussein regime that the United States overthrew in its invasion of Iraq three years before. Back then George W. Bush was president and Barack Obama was a junior U.S. Senator from Illinois. None of this is to defend Obama’s track record against ISIS, which in column after column here I’ve lambasted as incompetent and lackadaisical. His pseudo-war on that murder gang and its imaginary caliphate has been a train-wreck of quarter-measures, muddled strategy, and outright lies. Obama ought to never live down his dismissal of ISIS as the “JV team,” but that’s a far cry from “founding” the Islamic State. There’s no doubt that Obama’s withdrawal of American forces from Iraq in 2011, hailed as a great victory at the time, was strategically harmful and enabled ISIS’s meteoric growth in the Middle East. However, the president had little choice there, since the democratically elected Iraqi government in Baghdad demanded that the U.S. military leave their country. Not to mention that withdrawing our troops from Iraq was supported by Donald Trump. Saying Obama and Hillary “founded” ISIS therefore is a ridiculous claim that deserves to be taken no more seriously than related tinfoilisms like “Jews did 9/11” or “My cat is the Illuminati.” It’s therefore deeply alarming to see the GOP nominee say it—repeatedly. It’s not difficult to see where Trump gets such wacky ideas. Mike Flynn, his national security guru, has repeatedly come close to saying the same, hinting that Obama wanted ISIS to succeed. Flynn is a retired Army three-star general whom Obama fired as director of the Defense Intelligence Agency with ample cause. Since then, Flynn’s gotten cuddly with the Russians, regularly appearing on their propaganda network RT, even admitting he’s taken Kremlin money for a photo op with Vladimir Putin. This is where things get really interesting. “Obama created ISIS” has been a Kremlin trope for a couple years now and it’s frequently trotted out by Putin’s mouthpieces and online trolls. When your campaign is riddled with people on the Kremlin payroll, with deep ties to Moscow, it’s not surprising that the candidate starts mouthing their disinformation.